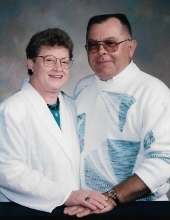 Arthur Bowen Ellsworth, 80, of Lapeer and Benzonia died Monday, February 4, 2019. Arthur was born May 3, 1938 in Davison to Arthur and Louise (Bowen) Ellsworth. As a boy Art worked on local dairy farms. He served his country proudly in the US Army. In 1965 he went to work for General Motors eventually becoming a millwright. He retired in 1995 after 30 years of service to GM. He was a member of American Legion Post #16 in Lapeer. Art loved to hunt and fish. Art is survived by two sons: Arthur (Marvin Wilkinson) Ellsworth of Denver and Gary (Theresa) Ellsworth of North Branch; 3 grandchildren: Cody Ellsworth, Brook Ellsworth and Dillon Ellsworth; sister, Virginia Lassen of Zionville, IN. Art was preceded in death by his dear wife, Doris Ellsworth in 2008, sisters: Lois and Lenore and his parents. In lieu of flowers memorial contributions may be made to the Michigan Parkinson Foundation, 30400 Telegraph Rd. Suite 150, Bingham Farms, MI 48025-5819. Visitation will be from 4-8PM Wednesday, February 6, 2019 at Muir Brothers Funeral Home, Lapeer. Art’s funeral service will be 2:00 Thursday, February 7, 2019 at the Muir Brothers. Art’s family will receive friends from 1-2PM prior to the service. Burial will be at the Imlay Twp. Cemetery - military honors under the auspices of American Legion Post #16 Honor Guard. Funeral arrangements have been entrusted to Muir Brothers Funeral Home, Lapeer. "Email Address" would like to share the life celebration of Arthur Bowen Ellsworth. Click on the "link" to go to share a favorite memory or leave a condolence message for the family.